Up to 84 percent of Americans will suffer from low back pain at some point during their lives. Sometimes there’s an obvious precursor to the pain, like a car accident or arthritis … but much more often, there is not. The pain is labelled “non-specific” back pain in these cases, which is another way of saying the cause of the pain is unclear. If you’ve ever gone to bed feeling fine one day and woken up with a seriously stiff and painful back, you know how frustrating this can be. It’s also not unusual to be going along with your ordinary day and then suddenly – *!$$#@! – you’re hunched over with back pain so severe you can hardly move. When the back-pain monster strikes, it might seem like it comes out of the blue. But more than likely you’ve probably been setting yourself up for the pain for some time. Let’s say you’ve been outside shovelling snow or spent a day washing windows. The twisting, turning and stretching involved is a veritable recipe for pain – especially if you’re a bit out of shape or you over-reach or over-stretch at all. But this isn’t surprising. You might well suspect and even brace yourself for back pain after a day of activities like that. Much more insidious, however, are the seemingly safe, mundane activities you may do on daily basis without so much as a hint that they’re actually the root cause of your ongoing pain. Sitting, whether while driving, working or watching TV, for long periods is not a natural state for your body. 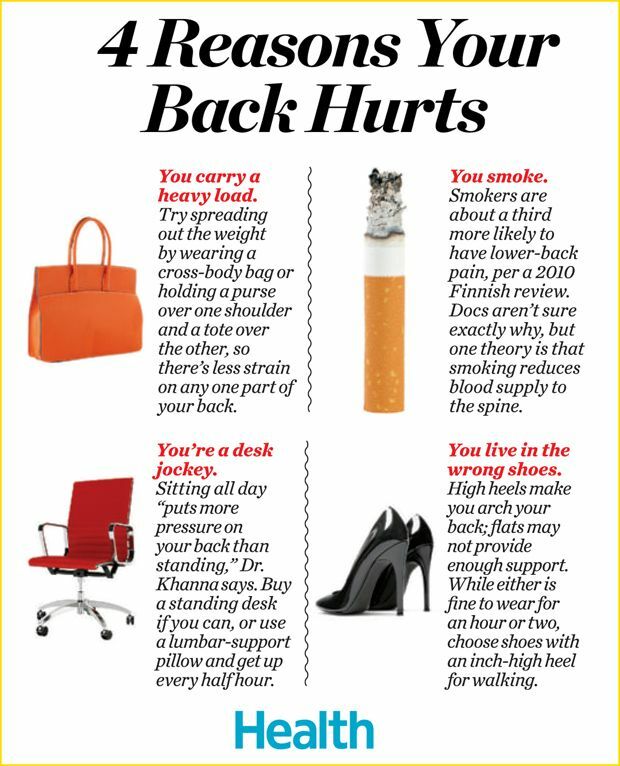 This puts incredible strain on the lumbar region of your back, and this is often compounded by improper workstation ergonomics and an improper desk chair. Slouching while you’re sitting, holding your head forward, and rounding your shoulders make matters worse, as this can overstretch your spinal ligaments and strain the discs in your spine. Over time this can damage your spine and cause chronic back and neck pain. The right chair can make a big difference, as can breaking up your sitting with periods of standing, but ultimately you need to sit less to protect your back. Each time you take out the garbage, carry in heavy bags of groceries, pick up your small children or grandchildren, haul your suitcase through the airport and engage in any other number of semi-strenuous activities, you put some strain on your back. Over time, this can lead to muscle imbalances. Your body is then forced to work each day with this dysfunction and eventually this creates a condition, like a herniated disc for example, which causes pain. Sneezing is well known to induce low back pain. This is because when you sneeze, there’s a tendency to lean your body forward (not necessarily intentionally). Together, this puts tremendous compressive force on the intervertebral discs. You can reduce your lower back load significantly during a sneeze by placing both hands on a table or deliberately maintaining an upright posture. When children carry heavy backpacks, it causes changes in postural angles and increased complaints of pain. Research shows worsening postural changes in children carrying backpacks in accordance with weight of the pack and time spent carrying the load. This puts the children at increased risk of pain, which, in turn, is a strong predictor of back pain in adulthood as well. Stress can absolutely make back pain worse and it may also play a role in triggering it. Stress leads to muscle tension that can cause pain, but, even more so, it can cause your body to launch an inflammatory response that causes and worsens pain. Not to mention that the stress hormone cortisol, which is produced by your adrenal glands in response to stress, is often elevated in people with uncontrolled pain. If you struggle with back pain, I can’t say this enough: a far-infrared heating pad is a must. Keep one at the office and one at home. You’ll be so glad you did, because as soon as you apply it to your back you’ll feel soothing deep heat. This is where far-infrared heating pads blow ordinary heating pads out of the water. Far-infrared rays lead to vibration effects at the molecular level, which improves transportation of oxygen and nutrients, ultimately helping to support regeneration and healing. The heat given off by ordinary heating pads, on the other hand, will only penetrate your skin, not the deep layers of tissues underneath, where pain resides. While the pain-relieving effects of ordinary heating pads usually disappear as soon as the heat is removed, far-infrared rays offer much longer pain relief, as the heat is capable of penetrating down two to three inches (compared to just 2-3 mm for regular heating pads). But don’t take my word for it. Try LosetheBackPain.com’s Far-Infrared Back Pain Heating Pad for 30 days risk-free — if you’re not thrilled with it, you get your money back. Next PostNext How to Really Avoid Back Pain When Doing Housework?